Pen drives or USB are quite popular in the digital world for instant transfer of data. Using USB flash drives, one can easily transfer large files from one PC to another, from PC to laptop, from laptop to TV, and vice versa. This latest technology has made our work easier than before. In current times, you can move Gigabytes of information into a tiny pen drive within few seconds. In recent years, a lot of changes has been made in storage devices. When you compare new pen drives with the older ones, you will notice a considerable high transfer rate in the latest ones. However, there are times when you can get irritated with slow transfer speed of pen drives while copying data in pen drives. Well, this article shall provide you with some tricks using which you can Speedup Pen drive Data Transfer Rate. 1. Pen drive ageing: Well, this is common for any device that when it becomes old, the rates gets slower. 2. Type of files: The transfer rate of data also depends on the file type; you might have noticed that songs, videos and documents take very less time in transfer while application files need more time. 3. USB port version: The most popular version of USB is 2.0, and it will give you 35mbps speed. So, if you want fast speed then buy 2.0 version pen drives. 1. File system should be NTFS: If you want to Speedup Pen drive , then make sure you have NTFS as file system. You can do so by Right clicking on your pen drive and selecting Format,Select NTFS File system, Uncheck Quick Format And Click On Start. 2. 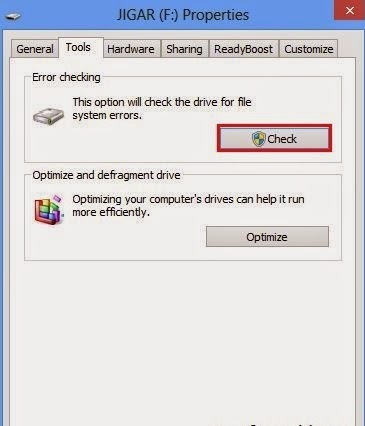 Disk errors: To check disk errors go to the properties tab of your pen drive, then select ‘tools’ tab. You will find a ‘check now’ button, click it and then hit ‘start’ to fix the errors. The time taken for scan depends on the size of the pen drive. 3. Device policy: Under properties of your pen drive, select ‘hardware’ tab. Then select USB device from there that will lead you to a pop up window where you need to change settings. You can even have better performance of pen drive by clicking the option under ‘hardware’ tab. 4. Format: This is one of the effective options that many users have tried. When you have used your pen drive for quite a long time, you can speed it up by formatting the device. Carefully test your pen drive with the factors given above to Speedup Pen drive. In addition to this, you should keep checking for these aspects regularly, say twice or thrice in a month.